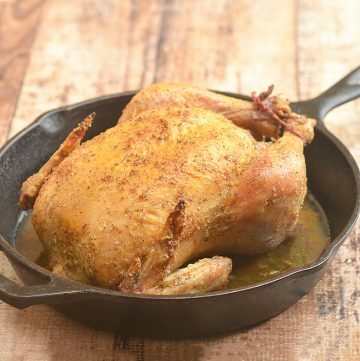 Skillet Roast Chicken that’s golden and crisp on the outside and moist, tender, and flavorful on the inside. All it takes is one hour to have this scrumptious meal on the dinner table making it the perfect meal for busy weeknights. This skillet roast chicken looks like a lot of work but it’s actually one of the simplest and easiest dishes you can pull together. It goes from the kitchen to the dinner table in less time than it would take to have food delivered from your favorite restaurant. Ready in about an hour and with just five ingredients, you’ll be blown away by how beautifully golden and incredibly moist the chicken comes out of the oven! Before I discovered this roasting method on America’s Test Kitchen, I used to pile on all the spices I can get my hands on to maximize flavor. Not anymore! 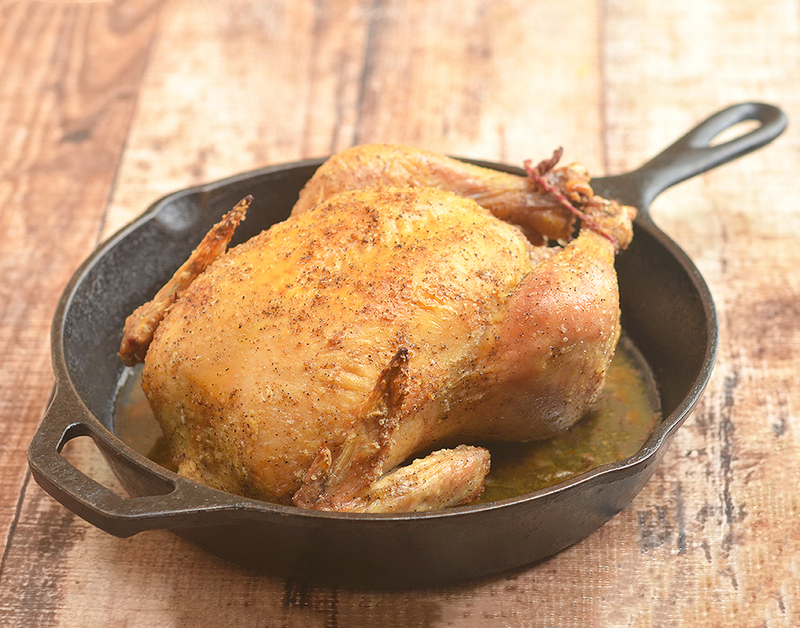 This chicken is surprisingly tasty with just kosher salt, garlic powder, pepper, and olive oil! There’s no need for fancy equipment also. Just your trusty cast iron pan or thick-bottomed skillet for a deliciously crisp, juicy, and flavorful meal that will go great with your favorite side dishes. 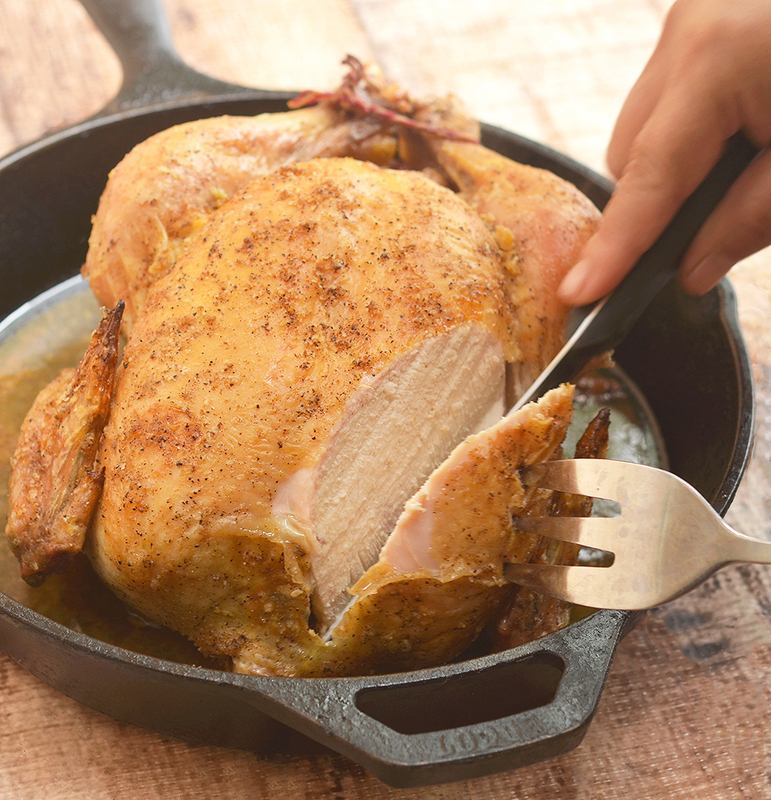 A great thing about roasting the chicken in a skillet instead of a roasting pan, you get a glorious pool of pan drippings you can easily turn into a gravy to spoon over mashed potatoes, rice, or even noodles. Dinner can’t get any easier! Don’t forget to put your cast iron skillet in when you preheat the oven! The preheated skillet will help sear the chicken thigh parts and allow them to cook congruently with the breasts. The success of this roasting technique depends on accurate temperatures, make sure to use a meat thermometer. To properly check temperature, insert the probe into the thickest part of breast just above the bone for white meat and insert the probe down between the tip of breast and thigh for dark meat. 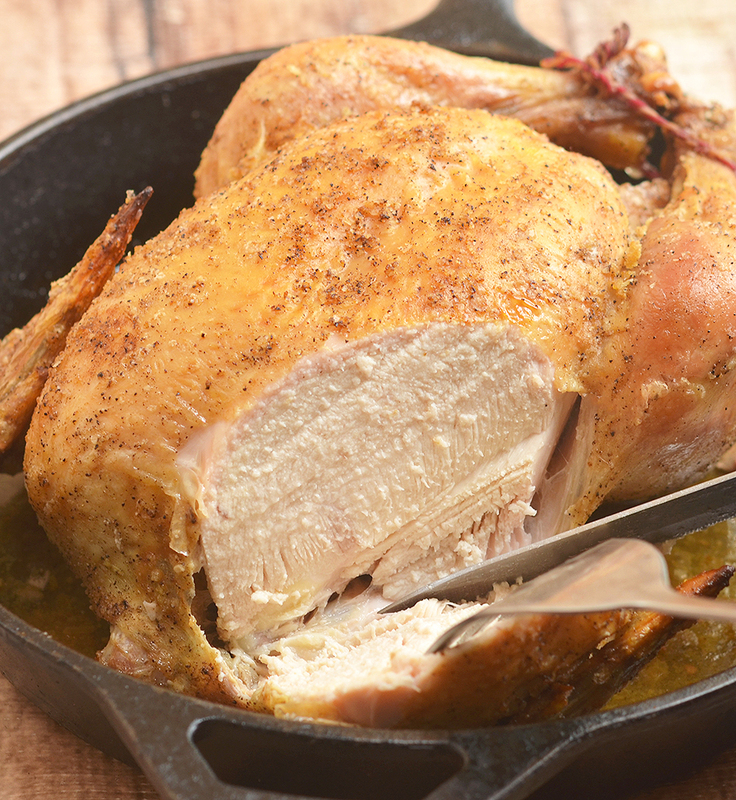 If you’re cooking a larger bird, increase the time the chicken stays in the “off” oven 35 to 45 minutes. Let the chicken rest uncovered for about 15 minutes before slicing to lock in the juices. While it’s resting, you can easily make gravy from the pan drippings. Add 1/3 cup of flour to 1/3 cup of pan drippings and cook, whisking regularly, for about 2 to 3 minutes or until smooth and lightly browned. Slowly add 3 cups of chicken broth, whisking vigorously to prevent lumps, until gravy thickens. Just look at that perfectly cooked chicken above, even the breast part is incredibly moist and well-seasoned! We rarely have leftovers when skillet roast chicken is on the menu so I like to occasionally cook an extra bird to use in one-pot pasta dishes, to top salads, or to fill quesadillas (with caramelized onions and gouda cheese, yum! ), tacos, enchiladas or burritos. 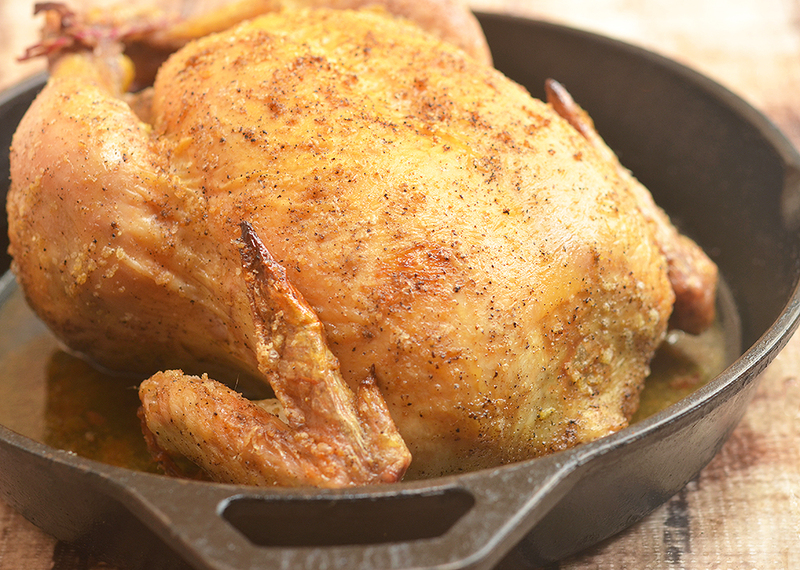 Skillet Roast Chicken that's golden and crisp on the outside and moist, tender, and flavorful on the inside. All it takes is one hour to have this scrumptious meal on the dinner table making it the perfect meal for busy weeknights. Adjust oven rack to middle position. Place a 12-inch cast iron skillet or an oven safe pan and preheat oven to 450 F.
In a bowl, combine salt, garlic powder, and pepper. Using paper towels, pat chicken dry. Rub olive oil on the entire surface. Sprinkle salt mixture evenly and rub all over chicken. Tie the legs together using kitchen twine and tuck wing tips behind back. Place chicken on preheated skillet with breast side up and roast chicken in 450 F oven for about 25 to 35 minutes or until breasts register 120 degrees and thighs register 135 degrees. Turn off the oven and leave the chicken in the oven for about 25 to 35 minutes or until breasts register 160 degrees and thighs register 175 degrees. Remove chicken from oven and transfer to a cutting. Let rest uncovered for about 15 to 20 minutes before slicing. Serve hot. That is a lovely bird. We haven’t made a whole chicken in far too long. Time to try this. 🙂 You’ll be amazed how moist and flavorful the chicken comes out in less than an hour and with simple seasonings! 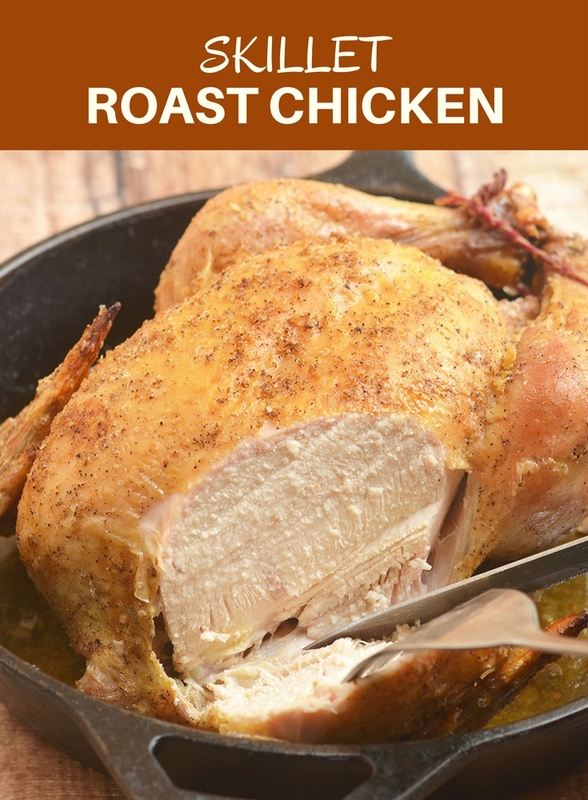 Roast chicken is always a favorite in my house – so nice to find different ways to prepare it!